By Monk Joseph Dionysiatis – 289 pgs. 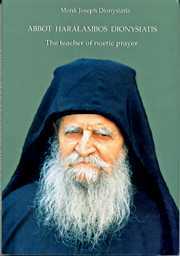 Another book about wonderful living monastic eldership in our times: the life and teaching of Elder Haralambos, one of the chief disciples of Elder Joseph the Hesychast. Fragrant with holiness and the presence of the miraculous blessings to those who live the life of holiness of the Gospel even today, this will help the reader’s heart soar towards Heaven.